Girls with Slingshots October of 2004, Danielle Corsetto began Girls With Slingshots, a couple of years later she was doing the strip full-time. It’s now updated 5 times a week at some god-awful hour. Drink, Drag, & regular Lesbian characters. The strip is centred around Hazel Tellingtons “The Lush” (Str8) and her orbiting friends. follow the from the start, humorous, silly & sometimes sad. Artifice is a sci-fi webcomic created by writer Alex Woolfson (me) and artist Winona Nelson that has now finished, so you can read the complete story from beginning to end. An android soldier fights for love and survival vs. an evil corporation. 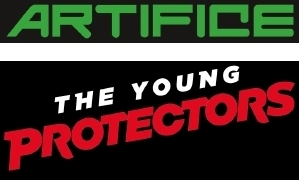 The Young Protectors: Engaging the Enemy is a multi-chapter superhero webcomic created by writer Alex Woolfson, penciler Adam DeKraker and colorist Veronica Gandini. It updates every Saturday. Prism Comics is a nonprofit organization that supports lesbian, gay, bisexual and transgender (LGBT) comics, creators, and readers. The Gay League is an online community for Gay, Lesbian, Bisexual, Transgendered, Transexual, and just plain friendly comic fans, collectors and creators worldwide. The purpose of the Gay League is to have a safe, hate-free, fun enviroment to read about, discuss, review, discover, trade, buy, sell, and learn information about comics – and make some friends online along the way. If you’re seeking a particular LGB or T mainstream/ offline comic character you’ll likely find them here.